Home to Ethiopia’s wildlife belt, more wildlife can be found in the diverse array of national parks in the southern region than anywhere else. Although the size of the wildlife populations doesn’t rival other African destinations, Ethiopia’s parks more than make up for the loss with their high number of endemic wildlife, the extraordinary birdlife, and the fact that the south remains home to a large range of species, however small their numbers. Add in the spectacular scenery, and it’s an absolute paradise. As well as wildlife, the South is known for its many differing ethnic cultures, most notably,the Mursi and Hamar, both from the southern Omo region. Their enduring traditions, their dress and their ceremonies are fascinating, and time spent in the Omo is time extremely well spent, the experience one that is capable of changing lives, for both guest and host. Less visited and less known than elsewhere, Chebera Churchura National Park remains relatively untouched. 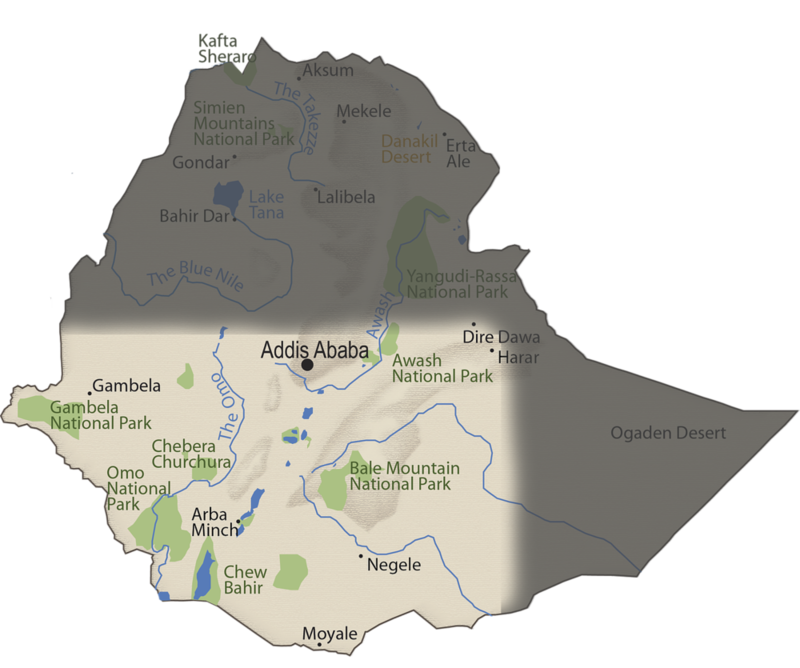 Mountains of over 2500 metres surround a fertile valley of rivers, streams and small crater lakes, giving rise to what for Ethiopia would be considered an abundant wildlife population. To date, 237 species of birds and 37 larger mammals have been found in the park, including elephant, hippopotamus, Cape buffalo, lion and leopard. The park also features hot and cold springs, caves, and magnificent riverine forests, the latter host to multiple species of mammal and bird. The Omo River marks the southern boundary of this beautiful park, all of which provides some fantastic territory for walking and exploring the remotest of wilds. Private camping with Wild Expeditions’s luxury Chebera Churchura Expeditions Camp. Bale Mountains National Park covers an area of approximately 2,150 square kilometres and rises to over 4,000 meters high to include the highest peak in the southern Ethiopian highlands. There are five distinct terrains in the park, including grasslands, alpine meadows and forests, all of which shelter the highest proportions of endemic wildlife in any terrestrial park in the world. One of Africa’s top birding sites, Bale is also home to 310 species of birds and an additional 170 species of migratory birds. Spectacularly scenic, the country lends itself to exploration on foot, by horseback, or by 4x4 vehicle. The trout fishing here is excellent, the rivers rich in both brown and rainbow trout. For a mobile experience exploring the Geysay Plateau, Bale Expeditions Camp, which combines well with an overnight at eco-luxury lodge Bale Mountain Lodge. A beautiful and very remote wilderness, Gambela National Park plays part home to the second largest animal migration in Africa. In the late dry season, the white-eared kob cross from the wetlands in the South Sudan into Gambela National Park. Sometimes travelling in herds 50 miles long and 30 miles wide, it is estimated that at least 250,000 of the estimated 1.2 million antelope can be seen at any one time. For wildlife enthusiasts, Gambela’s an absolute gem. Apart from the white-eared kob migration, it’s home to the rarely seen Nile lechwe, and to elephant, buffalo, giraffe, hippo and lion. The Baro River stretches along the northern and western boundaries of this park with some significant tributaries crossing through the area, making it ideal for water-based expeditions. Bird enthusiasts will be excited to know that the shoebill also inhabits the extensive wetlands, home to 110 different species of fish, including tigerfish and Nile perch. Maze National Park is a relatively small and recently designated national park in the Southern Nations State and can be visited either on the way the southern Omo region or as a destination in its own right. With a population of around 600 endemic Swayne’s hartebeest, numerous antelope species, and sightings of lion, leopard and cheetah, Maze offers an exciting area to spend a few days exploring. Although relatively small, its terrain is surprisingly diverse, and it’s surrounded by high mountains. Jets of steam mark the presence of a hot spring in the south of the park and the Maze River dissects the park, making for riverine forest populated with black and white colobus. Located in the Omo, the Mursi live in one of the most isolated regions of Ethiopia. These animistic pastoralists are best known to the western world for the large pottery lip plates that the women wear in their lower lips. The size of the plate is considered a measure of beauty and they are one of the last groups in Africa who still follow this tradition. The women also use a white chalk to paint intricate patterns on their skin and decorate themselves with intricate scarification patterns. Lale’s Camp serves as base, while the location of Mursi Mountain Fly Camp allows guests much closer and longer contact with the Mursi. Living in the Omo River valley, the Hamar are a 50,000-stong community of agro-pastoralists. Land is shared, and families often pool resources and herd their cattle together. The Hamar are most famous for their unusual rituals, including a bull jumping ceremony that marks the transition for young men into adulthood. Once the young man has leapt over a line of cattle, he can own cattle, marry and have children. As with the Mursi, Lale’s Camp serves as base, while the Hamar Fly Camp allows guests better opportunity for visiting the Hamar.